Home > News > It's Sedecim Time! To our esteemed Nobility and Aristocracy, our honored Gentry, Craftsmen and common folk, welcome to the Sedecim & Fair! Every 16 years (in game), a Sedecim takes place, where the nobility, aristocracy, gentry, and best craftsman of a continent all get together. They hash out the land boundaries and trade agreements, arrange marriages, and purchase and sample each others best wares. Weddings and festivities are held, and there's temporary booths set up so merchants can show off their goods. Furthermore, each Sedecim is hosted by a different Kingdom and Duchy, with a bid being submitted by each of the interested Royals and Courtiers at the preceding Sedecim. Having the nobles, craftsman, and tourists within your Duchy and County, even for a real-life week, can result in a dramatic increase in wealth and production. That being said, while festivities, food, and drink are a major part of the Sedecim, ballroom dancing isn't the only dancing that will be done. There's always a different Dance being played. To immerse you in the experience that is the Sedicim, make sure you first learn of the origins of this important event in the post below. To truly understand the premise and origins of this event, make sure you read this post. Since we're in a festive and collaborative mood, we decided it would be helpful to provide you with store items that match the theme of this all important affair. With that, we present the Sedecim and Fair limited promotion! Note: These items will be available in the store from 6/14 through 6/29 at noon Pacific time. Every farm starts somewhere. Usually, it's with livestock like this. It's the plan of many a wayward wanderer to settle down and start a farm with a sheep and a pig and some chickens, and maybe even some purebread horses. This kit won't help you with the horses, but the rest of that plan can be yours, today. For the more discerning farmer, only the best livestock will do! Sure, some simple wanderer might be all right settling into a farm with common animals and middling crops, but you're no simple wanderer weary from the road. You're a mann of distinction and only the best livestock will do. Prize livestock are healthier, bigger, and offer higher yields than their common counterparts. Why buy produce at market when you can grow your own? You scoff at "farms" that grow nothing but grass for their livestock. You're no simple farmer; you're a mann of the soil, with dirt in your blood and a pair of green thumbs! 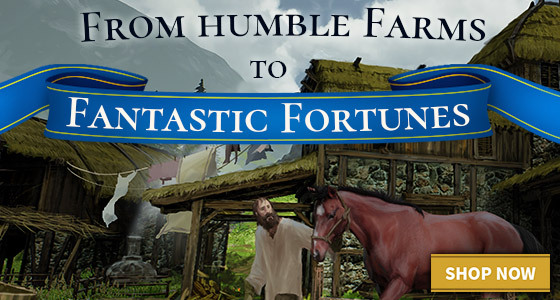 For you, farming is raising crops, turning the soil, and producing a legendary bounty. The seeds and tools in this kit are just what you need. There's one product that's never going out of style: cloth. Whether you're making clothing, blankets, flags, banners, or even paper, there will always be a need for textiles. Let the simple farmers raise the livestock and grow the food, you'll see to the more sophisticated needs of mann. A festival with no beer hall is like a sword without an edge. Ask a noble and they'll tell you that the royals' moot is the heart of the Sedecim; that treaties and what-not are most important. Ask literally anyone else where the heart of the Sedecim can be found and they'll point you to the nearest beer hall, where the real business is done to the songs of the minstrels and the clinking of ale mugs. Nothing defuses a tense political moment like levity and joy! Even in its earliest days, the Sedecim has always welcomed minstrels. They remind even the haughtiest noble of the value of good times, defuse tense situations with humor, and provide an atmosphere of welcoming joy that facilitates peaceful negotiation. If you have any questions about this event, please reply to this thread. This important event will only be around for 2 weeks! The Sedecim & Fair is over on June 29th, 2018 at 12pm Pacific time, so make sure you order your wares before they leave the store! Plan for your future, stock your settlement, be prepared to cultivate the world of Elyria! (Added 6/15/18) Thanks to Snipehunter for the answers, and Xeyska for organizing them. Q. Are the animals breeding pairs as in male/female pair? Are they random? A. Serpentius: Animal gender is chosen in game at the vendor. Q. About the seed pouch, is a pouch what it takes to plant a full parcel of land? A. Snipehunter: Each pouch in the promotion is enough to plant a parcel of land, for sure. That said, each seed is not a guarantee that each will turn into a plant or that that plant will survive. That's more about conditions and what you do as it grows. Q. Will the animals need specific "housing"? A chicken coop for the chicken, a sheepfold for the sheep and pigsty for the pig? If so how many animals can those buildings house? A. Snipehunter: Short answer to the first part of these questions: Yes, they will require protection from the elements. That said, if conditions are right, your animals may be fine in a simple paddock or pasture. It's not a mechanical requirement that a chick have a coop so much as it is a requirement that said chicken have a place to roost and not suffer due to exposure. Q. A follow-up question, for the sheep, do they need a pasture and if so how many sheep can a parcel of land sustain? A. Snipehunter: All of your animals are going to require proper care and nutrition, which really means that, yes, your sheep are going to need a pasture. I don't exactly know for certain how many a parcel of land will support on its own. IRL it depends on how much hay your parcel of land can grow which means an acre can range from supporting 1 to 5 or 6 sheep, but we'll probably allow for more sheep in a parcel than real-life conditions would allow, I just don't know by how much, yet. Though to be clear, most of this stuff will grow outside of Neran climates, though sometimes you'll have to make a little extra effort. It's harder to grow maize in colder climates, for example, but not impossible. Q. If we want these [items], do we have to buy them now with money or will we be able to get this kind of stuff with EP during Exposition? Resources purchased in exposition need to be used in exposition. You can't stockpile seeds purchased during exposition with the intent of using them at launch. Likewise, your livestock will age during expo and likely die before game launch (but you can use exposition to breed them, in all fairness). On the other hand, items you buy in a promotion can be redeemed after the game launches. The profession kits will include different things than these promo items. There is no minstrel profession kit planned in the EP store that includes three instruments, for example. Q. How many place settings are in each set in the Beer Party? A. Serpentius Each "Set" of 4 in the Beer Party have 4 place settings, for a total of 16. Q. Are the kegs full, and with what? A. Snipehunter: Yes, of Ale. They are also reusable. Kickstarterversary: This Ship is Sailing! Really would like to see more progress on game advancement rather than additional stuff for sale. Not buying anything else until Alpha is released. When this game will launch ? I'd like only to note that you can't grow potatoes from seeds. A "sack of small potatoes" would be much more appropriate item for the purpose. Potato plants do seed, however they are not commonly used for commercial production as growing it from the tuber produces a closer genetic match and preserves the desired hybrid qualities. Heirloom potatoes can be grown from the seed as they are not hybrid plants and will produce consistent results. Posted By **Blackbone** at 08:37 AM - Sat Jun 16 2018 > > I'd like only to note that you can't grow potatoes from seeds. A "sack of small potatoes" would be much more appropriate item for the purpose. Potato plants do seed, however they are not commonly used for commercial production as growing it from the tuber produces a closer genetic match and preserves the desired hybrid qualities. Heirloom potatoes can be grown from the seed as they are not hybrid plants and will produce consistent results. Will other players be able to steal or kill my farm animals or plants?? Everything in this game can be purchased, created, stolen, or killed. This includes purchased items. I love this promotion! I plan on buying the textile farm kit and gifting it to which ever farmer I can lure to my town! I have been waiting since 2015 for this! Thank you!!! Mixture of livestock... check. Seeds for a garden... check. Tools... check. Now I need fruit and nut trees, and buildings please. YYYYYeeeeeesssssss!!!!!!! Finally!!! I have been waiting since 2015 for this! Thank you!!! Mixture of livestock... check. Seeds for a garden... check. Tools... check. Now I need fruit and nut trees, and buildings please. Well, yeah Deftly. That said, I don't think there's a specific combat style for scythes in the game, at this point, so don't expect any particular badassery there. But regardless: hit someone with a razor sharp curved blade and, as Doug Mercaida might say, "it will cut." I am very glad to hear you say that. I am very interested in improvised weaponry and martial arts. I want my farmers to be effective and capable no matter what they might have on hand. It would be nice if actual technique could be created to compliment there lives and tools. Posted By **Snipehunter** at 3:37 PM - Fri Jun 15 2018 > > Well, yeah Deftly. That said, I don't think there's a specific combat style for scythes in the game, at this point, so don't expect any particular badassery there. But regardless: hit someone with a razor sharp curved blade and, as Doug Mercaida might say, "it will cut." > I am very glad to hear you say that. I am very interested in improvised weaponry and martial arts. I want my farmers to be effective and capable no matter what they might have on hand. It would be nice if actual technique could be created to compliment there lives and tools. If I use the scythe on people will that go towards a weapon skill? Don't know if this has been answered but if we want these do we have to buy these now with $ or will we be able to get this kinda stuff with EP during exposition? This has made me think of a question. What happens if during expo I - as a PC - purchase resources and then turn around and immediately sell them to an NPC? I mean I know they'll disappear after expo, but do they? Once expo ends will they lose those resources if they haven't used them (just like PCs)? Also, it caught me off guard that seeds count as "resources" for the purpose of stuff disappearing post expo. So, would it be possible at some point in the relatively near future to list all the things/types of stuff that will disappear? I think this will be very helpful for planning purposes, as well to make sure people can make informed decisions. Posted By **Snipehunter** at 1:22 PM - Fri Jun 15 2018 > > - Resources purchased in exposition need to be used in exposition. You can't stockpile seeds purchased during exposition with the intent of using them at launch. Likewise, your livestock will age during expo and likely die before game launch (but you can use exposition to breed them, in all fairness). On the other hand, items you buy in a promotion can be redeemed after the game launches. This has made me think of a question. What happens if during expo I - as a PC - purchase resources and then turn around and immediately sell them to an NPC? I mean I know they'll disappear after expo, but do they? Once expo ends will they lose those resources if they haven't used them (just like PCs)? Also, it caught me off guard that seeds count as "resources" for the purpose of stuff disappearing post expo. So, would it be possible at some point in the relatively near future to list all the things/types of stuff that will disappear? I think this will be very helpful for planning purposes, as well to make sure people can make informed decisions. That's interesting. While I have come to accept you can't stockpile anything, couldn't you just place animals etc in the last week of expo? Since no idea how many farmers/animal breeders would be setup completely that fast. While how long can someone wait to redeem promotion items after launch? First day they log on type of deal? Or first day of launch and if they aren't online tough? Posted By **Snipehunter** at 03:22 AM - Sat Jun 16 2018 > - Resources purchased in exposition need to be used in exposition. You can't stockpile seeds purchased during exposition with the intent of using them at launch. Likewise, your livestock will age during expo and likely die before game launch (but you can use exposition to breed them, in all fairness). On the other hand, items you buy in a promotion can be redeemed after the game launches. That's interesting. While I have come to accept you can't stockpile anything, couldn't you just place animals etc in the last week of expo? Since no idea how many farmers/animal breeders would be setup completely that fast. While how long can someone wait to redeem promotion items after launch? First day they log on type of deal? Or first day of launch and if they aren't online tough? That is a very good question... I hadn’t realized it until now but I’m wondering the same thing. Some things that I have and may purchase prior to Exposition may not be needed for quite a while after launch. I could see a few months IRL going by. Is that too long? Why would it matter how long I hold onto something? Posted By **Gunnlang** at 9:53 PM - Fri Jun 15 2018 > > While how long can someone wait to redeem promotion items after launch? First day they log on type of deal? Or first day of launch and if they aren't online tough? > That is a very good question... I hadn’t realized it until now but I’m wondering the same thing. Some things that I have and may purchase prior to Exposition may not be needed for quite a while after launch. I could see a few months IRL going by. Is that too long? Why would it matter how long I hold onto something? Yea but will there be jousting at these events, and also can it just be a night's tale? I just want to watch a nights tale again guys. That's why I'm here. I just wanna see that trumpet solo again. Will these farm kits be affected by your biome? can you grow cotton in the jungle, forest or colder climate? Well I, for one, am pretty sold on the beer party.. for whichever plans you might have for the game, you can always improve them with beer. What about wetlands? will cotton then be 100% "dead" upon raising, and will there be any help with finding out what the conditions are? or are we supposed to experiment with the 200 seeds and pray we get it right at least once, especially so since some of the seeds might also not even grow up regardless of if you're fulfilling the requirements or not? I know this isn’t much help but when it came to mounts being useless in some biomes they stated the mount would be a token and we could choose between a few on the same tier with the one(s) most applicable to our biome showing differently on the interface. Perhaps something like this could be setup for the various supply/resource packs from the store. Since these packs will be unavailable for purchase post launch it wouldn’t be game breaking to give us a hint, or since they come from a vender have that vendor only stock what would work for that biome. Like instead of corn  you would receive rice  or something similar for a wetlands area. Same tier and quality just different genus. Posted By **Liva** at 06:14 AM - Fri Jun 15 2018 > > What about wetlands? will cotton then be 100% "dead" upon raising, and will there be any help with finding out what the conditions are? or are we supposed to experiment with the 200 seeds and pray we get it right at least once, especially so since some of the seeds might also not even grow up regardless of if you're fulfilling the requirements or not? I know this isn’t much help but when it came to mounts being useless in some biomes they stated the mount would be a token and we could choose between a few on the same tier with the one(s) most applicable to our biome showing differently on the interface. Perhaps something like this could be setup for the various supply/resource packs from the store. Since these packs will be unavailable for purchase post launch it wouldn’t be game breaking to give us a hint, or since they come from a vender have that vendor only stock what would work for that biome. Like instead of corn  you would receive rice  or something similar for a wetlands area. Same tier and quality just different genus. One thing I'm curious about for practicality and logistics. Cows are most commonly associated with milking; for butter, cheese, yogurt and the milk itself. However both goats and sheep are used for them as well. Will the sheep, be possible to milk like you can in real life? I ask because, as while people generally know goats can be milked... sheep are a much lesser known alternative. One thing I'm curious about for practicality and logistics. Cows are most commonly associated with milking; for butter, cheese, yogurt and the milk itself. However both goats and sheep are used for them as well. Will the sheep, be possible to milk like you can in real life? I ask because, as while people generally know goats can be milked... sheep are a much lesser known alternative. I love it. I bought the Livestock artisan, only the best Livestock for a Duke. I'm curious as to the skills that are going to be needed for the livestock. Is the plan going to be having a general ...idk animal husbandry skill that would be all encompassing for the pigs, sheep, and chickens are is there going to be separated skills ala albion online that will have individual skill trees and will more advanced skills be necessary to ensure the prized pig as it were doesn't just up and die on you. I'm curious as to the skills that are going to be needed for the livestock. Is the plan going to be having a general ...idk animal husbandry skill that would be all encompassing for the pigs, sheep, and chickens are is there going to be separated skills ala albion online that will have individual skill trees and will more advanced skills be necessary to ensure the prized pig as it were doesn't just up and die on you. Thanks for any information. Well I almost made it out unscathed but NOPE! /reads post Dumb farm animals sale. PASS PASS PASS Yay saved some money. MINSTREL'S GEAR! Well I almost made it out unscathed but NOPE! Farming, crops and cattle are arguably the most important asset in any kingdom. You either do it yourself or import it because your visitors, citizens, merchants, nobility and military cannot eat armor, weapons, ore etc. Doesn't matter how big your army is or how wealthy you are, how many precious resources you have, if you have no food, you won't havea kingdom for very long. I bought a considerable amount of these items to begin strong from launch. Posted By **Maric** at 12:37 PM - Fri Jun 15 2018 > > /reads post > > Dumb farm animals sale. > > PASS > PASS > PASS > > Yay saved some money. > > MINSTREL'S GEAR! > > Well I almost made it out unscathed but NOPE! Farming, crops and cattle are arguably the most important asset in any kingdom. You either do it yourself or import it because your visitors, citizens, merchants, nobility and military cannot eat armor, weapons, ore etc. Doesn't matter how big your army is or how wealthy you are, how many precious resources you have, if you have no food, you won't havea kingdom for very long. I bought a considerable amount of these items to begin strong from launch. Broadly, the profession kits include different sorts of items. For example, the Minstrel's kit might include a songbook for the Minstrel or something of that nature. How do these kits (livestock starter, seed stacks, textile farm kit) differ from the profession kits for farmers? I know in my discussions with others is kits such as theses that offer redemption with a NPC vendor would be usable by any account package. In regards to the profession kits to my knowledge that is purchased via EP, which would require a bloodline or higher package. Looking at EP kit post, https://chroniclesofelyria.com/forum/topic/19128/ep-kits-and-item-projection we have a cost for a profession kit being 100 EP. Which has a group of items with approximate discount at 20%. My estimate would be the individual items in a profession kit will equal about 120-125 EP if purchased separately. So contents in a profession kit may be comparable to what we see in these kits or may be different. So these kits and hopefully maybe we will see some smaller size versions stay around in the store in the future is something I can point to players with Adventurer level packages to pick up to give them a start when they play the game at launch or afterwards. I know in my discussions with others is kits such as theses that offer redemption with a NPC vendor would be usable by any account package. In regards to the profession kits to my knowledge that is purchased via EP, which would require a bloodline or higher package. Looking at EP kit post, https://chroniclesofelyria.com/forum/topic/19128/ep-kits-and-item-projection we have a cost for a profession kit being 100 EP. Which has a group of items with approximate discount at 20%. My estimate would be the individual items in a profession kit will equal about 120-125 EP if purchased separately. So contents in a profession kit may be comparable to what we see in these kits or may be different. So these kits and hopefully maybe we will see some smaller size versions stay around in the store in the future is something I can point to players with Adventurer level packages to pick up to give them a start when they play the game at launch or afterwards. Looks great... I would have appreciate Hemp instead of cotton tho... would make more sense. I'm a little hesitant about getting the seeds along with the farm animals I'll be having, as I don't really want to buy them only to find out they're fairly pointless for me to try grow in the Brudvir's colder climate. I really don't want my animals to starve nearly immediately, after all. Are the seeds, going to be predominantly for the milder 'Neran' climates, or will they be possible to use in the colder climate straight "out of the box" so to speak? (ie. Receiving seeds that are more resistant to the cold than what someone else might receive.) I'm a little hesitant about getting the seeds along with the farm animals I'll be having, as I don't really want to buy them only to find out they're fairly pointless for me to try grow in the Brudvir's colder climate. I really don't want my animals to starve nearly immediately, after all. Ready to get pissed for sure. If i take out a second mortgage on my house to cover my CoE spending, does the wife get half the debt in the ensuing divorce? Edit: Though to be clear, most of this stuff will grow outside of Neran climates, though sometimes you'll have to make a little extra effort. It's harder to grow maize in colder climates, for example, but not impossible. Oh wheat exists, it's just not a part of these packs. Thank you Snipehunter that helps a lot. Will the promotional seeds / textiles be growable in all biomes (or will there be biome appropriate equivalents)? will the animals need specific "housing" ? a chicken coop for the chicken, a sheepfold for the sheep and pigsty for the pig ? if so how many animals can those buildings house ? a followup question, for the sheep, do they need a pasture and if so how many sheep can a parcel of land sustain ? will the animals need specific "housing" ? a chicken coop for the chicken, a sheepfold for the sheep and pigsty for the pig ? if so how many animals can those buildings house ? a followup question, for the sheep, do they need a pasture and if so how many sheep can a parcel of land sustain ? About the seed pouch, is a pouch what it takes to plant a full parcel of land ? Each pouch in the promotion is enough to plant a parcel of land, for sure. That said, each seed is not a guarantee that each will turn into a plant or that that plant will survive. That's more about conditions and what you do as it grows. Short answer to the first part of these questions: Yes, they will require protection from the elements. That said, if conditions are right, your animals may be fine in a simple paddock or pasture. It's not a mechanical requirement that a chick have a coop so much as it is a requirement that said chicken have a place to roost and not suffer due to exposure. All of your animals are going to require proper care and nutrition, which really means that, yes, your sheep are going to need a pasture. I don't exactly know for certain how many a parcel of land will support on its own. IRL it depends on how much hay your parcel of land can grow which means an acre can range from supporting 1 to 5 or 6 sheep, but we'll probably allow for more sheep in a parcel than real-life conditions would allow, I just don't know by how much, yet. Will there be more ways to be a farmer than the presented possibilities? What about fruit trees or berry bushes? Will the kegs in the Beer Party package contain anything in them or the kegs empty? I'm wondering about this too :) - What is a beer-party without...erm...beer? Posted By **Vadaryl** at 01:41 AM - Fri Jun 15 2018 > > Will the kegs in the Beer Party package contain anything in them or the kegs empty? I'm wondering about this too :) - What is a beer-party without...erm...beer? Amazing! I love the minstrel's gear.